A small cache of Bronze Age palstaves found in a ditch close to the Cranbrook road in 1855 is the earliest indication of life at Goudhurst. Although Goudhurst is not mentioned in the Domesday Book, its parish church of St Mary the Virgin is referred to in the Domesday Monachorum of a similar date, indicating that there was a settlement here from at least Saxon times. 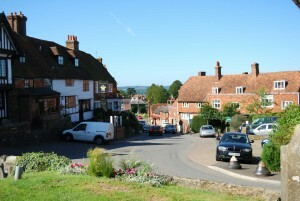 The place-name Goudhurst is derived from its location on top of a hill in the former forest of Andresweald, the “hurst” element referring to the wooded hill on which it stands. As regards commercial activity, in 1309 Edward II granted a licence for a weekly market and two annual fairs to be held. By the late 16th century there were at least two iron furnaces in Goudhurst, and the one situated at Bedgebury is said to have supplied some of the cannons used to defeat the Spanish Armada in 1588. Thanks to its proximity to Cranbrook, Goudhurst became involved in the cloth-making industry centred on that parish during the 17th century, and there were still a few looms in Goudhurst until the early 1700s. 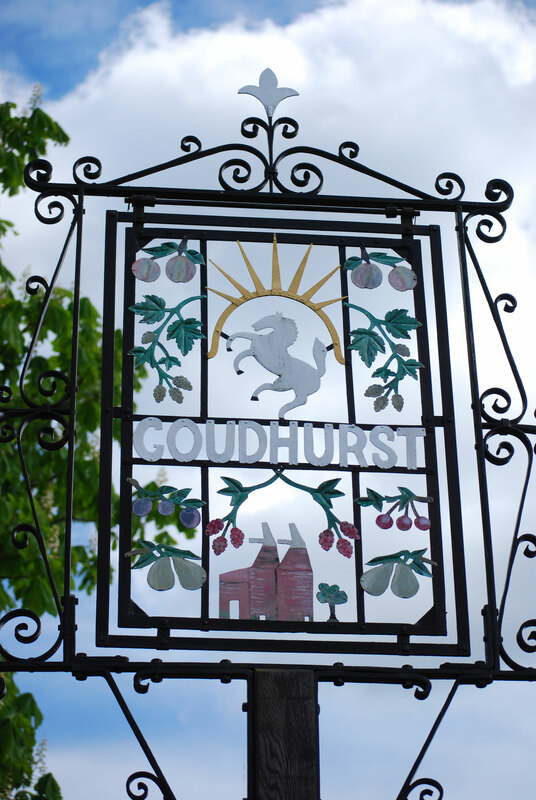 In 1747 the notorious group of local smugglers known as the Hawkhurst Gang were firmly beaten in a battle between them and a group of local inhabitants led by William Sturt, who later became master of the Goudhurst workhouse. Overall, however, Goudhurst remained an agricultural parish in which, as the cloth and iron industries declined and the 19th century dawned, hops, apples, plums and pears joined the more traditionally grown cereal crops. 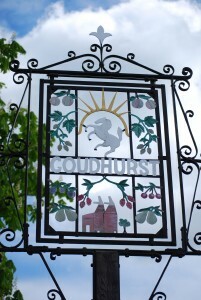 Until more recent times Goudhurst would have been entirely self-sufficient, with its own mix of trades and craftsmen from blacksmiths to wheelwrights, and bakers to butchers. Even today the village still has a good selection of shops. Although the village appears on Hasted’s map of 1778 as Killdown, there are earlier maps which show the name variously as Gildendown and even Down Kiln. The exact derivation of the name is uncertain, and it has been suggested that it may either have been derived from an oast kiln on the down, or relate to the fact that bricks were once made in the area. Over the centuries, two notable estates have existed near the village: the Augustinian establishment at Combwell was founded originally as an abbey during the reign of Henry II, but lack of means reduced its status to that of a priory in 1220. It fell victim to the Reformation in the 16th century and nothing of the original buildings now remains. 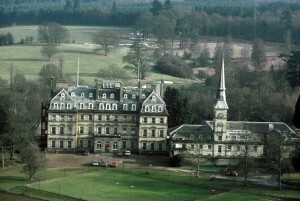 Bedgebury is first mentioned in a charter dated 814. Home of the Culpeper family during the 16th century, the estate included the iron furnaces reputed to have made guns which helped to defeat the Spanish Arm ada in 1588. 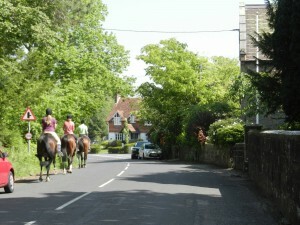 The most substantial growth of the village and its community ensued when the Bedgebury estate was purchased by Viscount Beresford in 1834. Active development of the estate, coupled with the fact that access to the nearest facilities involved a hilly, muddy 4-mile round trip to Goudhurst, caused Christ Church to be built in Kilndown by public subscription in 1839 to a design by the architect Anthony Salvin. It was, however, considered too austere by Alexander Beresford-Hope of Bedgebury, whose influence and money resulted in the interior seen today. Kilndown thus became an ecclesiastical parish within Goudhurst in 1843. 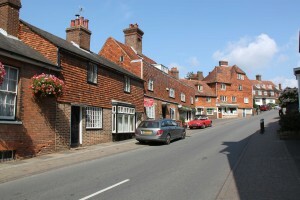 Kilndown developed its own shops, public house and craftsmen, and although the fortunes of these have fluctuated over time, the village is still an active community.